As for Google, without a more ‘joined up’ EU legal and regulatory framework integrating digital rights and economic concerns, users may need to look to solutions outside the law. 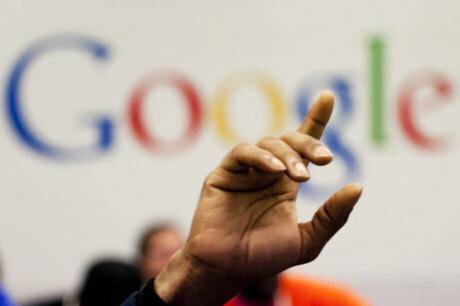 A man raises his hand in Google office.Mark Lennihan /Press Association. All rights reserved. Large Internet corporations are increasingly exerting an influence over the social and political aspects of our lives as well as economically influencing the marketplace. Google is foremost among them as a very large and very pervasive private actor in the online space, providing everything from search to email to mobile operating systems. Google’s business model may also be viewed as particularly concerning from a digital rights perspective, given the vast amounts of data created by and about its users which power its services. As the Snowden revelations uncovered, national security agencies have also tapped into this vast data bank under Google’s control in less than legitimate and transparent ways. What then about the law? Google’s business practices have clashed with different laws in different countries. Google’s practices have also been curtailed somewhat by European data protection law, such as by recognising European citizens’ ‘right to be forgotten’ from its search results in certain circumstances, and by curtailing Google’s ability to combine user data from across its myriad services. But even the EU’s data protection laws have been criticised by prominent legal academics in the field. In Bert-Jan Koops’ view they only have a marginal effect on real-world data processing practices. Lynskey also calls them ‘permissive’ laws which allow for the collection of personal data (so long as certain criteria are met) ‘endors[ing] the commodification of personal data’. Data protection law is also not very concerned with the size of the entity collecting and processing the data – whether it is in a competitive marketplace or whether it is a monopoly. Furthermore, human rights are generally only enforceable vis-à-vis the nation-state rather than vis-à-vis private actors, despite these actors being transnational corporations that are richer and more powerful than certain countries. Given Google’s ubiquity, one area of law which we might turn to is antitrust, or competition, law. These laws are designed to combat the negative effects of monopoly power for consumers, and to stop competitors colluding with each other. Indeed, the most prominent example of legal proceedings against Google globally continues to be the ongoing European Commission antitrust investigation into its alleged abuse of dominance in its search and advertising business. The European Commission started investigating Google after complaints were made by Google’s competitors in the ‘vertical search’ price comparison markets: originally price comparison site Foundem, ejustice.fr (a French legal search engine) and German shopping site Ciao (owned by Microsoft). Subsequently the competitors have formed a lobby group, FairSearch. The complaints against Google alleged that Google was using its dominant position in online generic search and advertising to give it an unfair advantage in these other markets. The investigation was opened in 2010 and has still yet to reach a conclusion. During this time, the US authorities have also considered Google’s conduct, and in 2013 concluded that this conduct did not violate antitrust laws. This was because the design changes Google adopted for its search results page (it displayed its own vertical search results more prominently and had the effect of pushing the organic search links further down the page) were done primarily to improve the ‘quality’ of its search product and the overall ‘user experience’. However, the saga between Google and the European Commission has been lengthy and drawn out. The Commission has twice rejected offers from Google to change its behaviour. The Commission seemed to accept Google’s third proposal in early 2014, yet bowed to lobbying pressure later that year in appearing to reject the third proposal after the ‘politicisation’ of the case within the EU. Google’s offers have involved potential changes to the search results page, particularly as regards labeling of different kinds of results and the more prominent placement of links to competitors’ services. It has always been in Google’s interests to reach a settlement with the Commission since otherwise the Commission would proceed with a full-blown investigation, quite probably resulting in the imposition of remedies as well as a large fine (up to 10 percent of global turnover). Interestingly, it is actually unclear whether Google’s alleged conduct vis-à-vis its competitors actually constitutes a violation of EU competition law, as it does not fall within a recognized ‘head’ of abuse of dominance. Even if the Commission concluded its investigation and found that Google was abusing its dominant position, Google would still be able to appeal the case to the European courts, which may take a narrower view of the situation based on previous monopolies case-law. From the user perspective, however, given the size and pervasiveness of Google, if the investigation outcome is that Google must only make some relatively superficial changes to how its search results are presented, remedy may seem rather weak. More transparency regarding Google’s algorithm and inner machinations does not seem to be on the table (and would likely be stymied by trade secrets protection), nor are any measures which would tackle Google’s vast collection of user data (the reforms to European data protection law in the form of the new Regulation will not tackle this either). This may seem surprising to many, given Google seems to be obviously a monopoly. But EU competition law has been influenced by the same neoliberal trends that have permeated economic regulation more generally, and accordingly only operates in a minimalist way. Yet in the past, competition law in Europe, especially Germany, was influenced by ordoliberal currents which were suspicious of large accumulations of private power for both the economic and political influence that such entities could wield. In its early history, US antitrust law also was suspicious about private power’s political as well as economic influence. Google’s ever-expanding size and portfolio can be conceptualised as exactly the kind of private power accumulation which concerned the ordoliberals. Indeed, Google’s vast (and ever growing) concentration of power is political as well as economic, with large amounts of its money being invested in political lobbyists and even funding research at universities and think tanks. This influence may pose problems for the democratic process and democratic oversight over such a large company. Yet, throughout the Google investigation the Commission has said very little about Google’s impact on its users’ digital rights. However, the European Data Protection Supervisor in 2014 did make a connection between Google’s monopolistic size and its practices of gathering large amounts of user data, calling for competition analysis to incorporate data protection violations into its conception of ‘consumer harm’. But EU competition law’s ‘More Economic Approach’ means that it is difficult to take into account values, such as human rights, in the largely quantitative and financialised analysis of whether anticompetitive conduct by a monopoly has caused consumer harm. Indeed, ‘ the pursuit or consideration for other non-economic goals under competition law is at odds with neoliberalism’, and so likely to give rise to much regulatory tension if competition bodies find themselves under pressure to apply non-economic values that may be encompassed by human rights – in both this case against Google and in other investigations involving other rights beyond the digital. But why has the Commission been pursuing Google, especially if it’s not clear that Google is committing a recognised abuse of its dominant position or that the investigation will result in a good outcome for users? The explanation may be found in factors such as: European protectionism when faced with an American corporation (although some of Google’s competitors which have been making the complaints are also American); the Commission’s own political concerns, such as being seen by the general public to be a relevant institution by acting in the face of what many perceive as a pernicious monopoly; and lobbying from a coalition of European ‘digital companies’ mainly from France and Germany, and some domestic politicians from these countries who also urged the Commission to reconsider the commitments previously offered by Google. The outcome of the European Commission’s investigation into Google remains to be seen. But it seems clear so far that the Commission has not been overly ‘invasive’ of Google’s business practices, and particularly those which pose the most concern for users. Furthermore, it is far from clear that Google’s overall power will be dramatically weakened as a result of the investigation. Instead, it may be that it is Google’s competitors who benefit in the end, rather than users. Where does this leave us, the users? Essentially, caught between one area of law, competition, which aims to tackle monopolies but is not good at taking our digital rights into account; and another area of law, data protection, which (as the name suggests) is supposed to protect our data but is not very concerned with monopolies collecting vast amounts of data so long as its criteria for collection and processing are met. The EU’s Charter of Fundamental Rights has been invoked in a number of recent cases (Scarlet v SABAM, Digital Rights Ireland, Schrems) to protect personal data and curtail state-directed surveillance and monitoring via private companies. However, it is far from clear that a private company, collecting user data for its own ‘economic surveillance’ purposes would be treated in the same way. Without a more ‘joined up’ EU legal and regulatory framework which integrates both digital rights and economic concerns when it comes to Internet monopolies such as Google, users may have to look for solutions outside of the law to protect their privacy, enhance their free expression and promote their economic autonomy. This article is based on the discussion about Google in Angela Daly’s forthcoming book Private Power, Online Information Flows and EU Law, which will be published in late 2016 by Hart.